I COULD NEVER be a cop. They put up with too much crap from the great ungrateful and the grated unhinged. Ride along with a patrol officer and you'll see what they deal with every day. 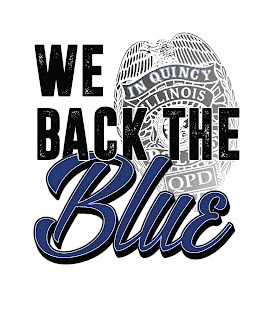 Yes, there are bad police officers out there, and you sure as heck hear about it, but in Quincy and this area our law enforcement officers are dedicated, hard-working and good people. Cindy Vancil-Haxel, owner of Vancil Performing Arts, is showing her appreciation for local law enforcement officers by putting her time, money and effort into "Back The Blue." There is a press conference Friday morning at City Hall, and Cindy will start handing out "goodie bags" to officers and administrators at the Quincy Police Department. Here's one thing about Cindy - if she puts her mind to it, it will get done. She organized a committee, went out to the community and raised the money, and she's determined to show QPD she is proud of their service, and appreciates what they do for us every day. And, of course, the canine officers will get special treats. Cindy and her beloved dog, Eva, are very good at handing out presents to other animals - I defy you to find a music store anywhere that has not one but TWO Christmas stockings for the store cat. Fast Eddie, of course, loves it. I'm helping Cindy with some PR for the press conference, so you'll be hearing more about it toward the end of the week. She'll be on WGEM's NewsTalk 105 Friday morning at about 8:10 with Greg Haubrich, and doing other media spots. We Back The Blue. Thank you, Cindy, for helping us show our appreciation.